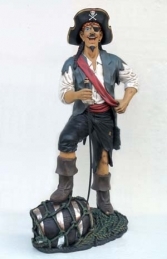 This 4ft tall resin model of a Pirate Boy stood at a replica ship's wheel with a telescope to his eye is a charming addition to our Pirate model range. He is ideal for any children's Pirate theme play area. With his over-sized sword, huge pirate boots , skull and cross bones hat, this charming character Pirate Boy model is delightful. This fantastic child-sized figure is ideal for themed play-areas, advertising or drawing attention to your business. It can be used in any pirate themed area or in shops, businesses, pubs, restaurants, coffee shops, adventure golf courses, zoos, theme parks or even in your own home.